CSKA Moscow rounded the 2011-12 Turkish Airlines Euroleague Top 16 in style by downing Anadolu Efes 65-82 in Istanbul, Turkey on Thursday. CSKA won Top 16 Group E with a 5-1 record and will have the home court advantage in the upcoming playoffs. Anadolu Efes was mathematically out before the game and was fourth in Group E at 1-5. Therefore, it was also the last Euroleague game to be played at Sinan Erdem Arena before the 2012 Final Four. Andrei Kirilenko led the winners with 15 points. Jamont Gordon added 14, Nenad Krstic had 13 while Alexey Shved got 11 for CSKA. Sasha Vujacic led Efes with 17 points. Dusko Savanovic added 16 while Esteban Batista had 10 for the hosts. A three-pointer by Gordon gave CSKA a 20-22 edge after 10 minutes. Darjus Lavrinovic led a 0-7 CSKA run that gave his team a double-digit lead, 33-44, near halftime. Shved and Andrey Vorontsevich took over after the break, allowing CSKA to keep a safe 54-64 margin after 30 minutes. Nothing changed from that moment, as CSKA boosted its margin to 55-71 and cruised to yet another well-deserved win. Kirilenko got CSKA going with a three-pointer. Vujacic sank a jumper but Shved answered from downtown for a 2-6 CSKA lead. Efes managed to be more aggressive on defense early in the game. Meanwhile, Vujacic downed a turnaround jumper and Tarence Kinsey finished a two-chance offense with a corner triple that gave Efes its first lead, 7-6. Kirilenko split free throws and banked in a close shot to put the guests back ahead, 7-9. Oliver Lafayette shined with a driving layup but Kirilenko erased it with a fast break basket and free throws by Viktor Khryapa gave his team a 9-13 edge. Batista scored around the basket and a three-pointer by Vujacic provided another lead change, 14-13. Vujacic stayed on fire with a jumper in transition and Batista hit a jum hook but Nenad Krstic kept CSKA within 18-17. Krstic and Savanovic traded free throws and Gordon struck from downtown for a 20-22 CSKA lead after 10 minutes. 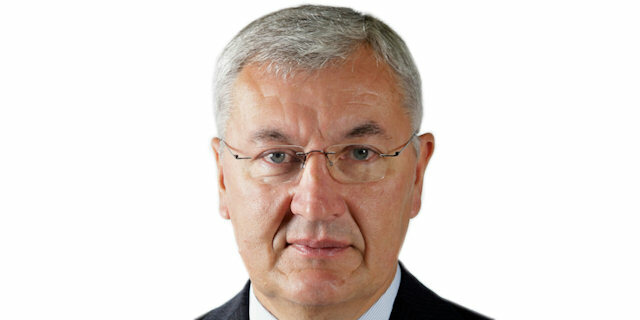 Savanovic made foul shots early in the second quarter that Milos Teodosic bettered with a wild catch-and-shoot three-pointers. Sasha Kaun took over with a put-back slam and Savanovic hit a jumper to get Efes within 24-27. 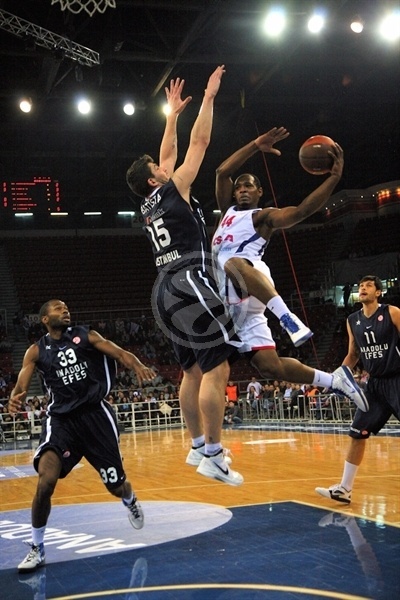 Gordon buried a jumper but Cenk Akyol imroved that with a triple to bring Efes even closer, 27-29. Vorontsevich buried a shot and a jump hook by Krstic gave CSKA a five-point lead, 28-33. Batista split free throws but Lavrinovic swished his trademark three-pointer for a 29-36 CSKA margin. Lafayette tried to change things with an off-balance shot and Batista erased Lavrinovic's put-back basket with a layup. Shved buried a jumper and fed Vorontsevich for an alleyoop slam, forcing Efes to call timeout at 33-42. A fast break layup by Lavrinovic soon made it a double-digit game, 33-44. Akyol hit an off-balance shot and a second-chance basket by Lafayette gave Efes some hope at 37-44. A wide open corner triple by Shved fixed the halftime score at 37-47. 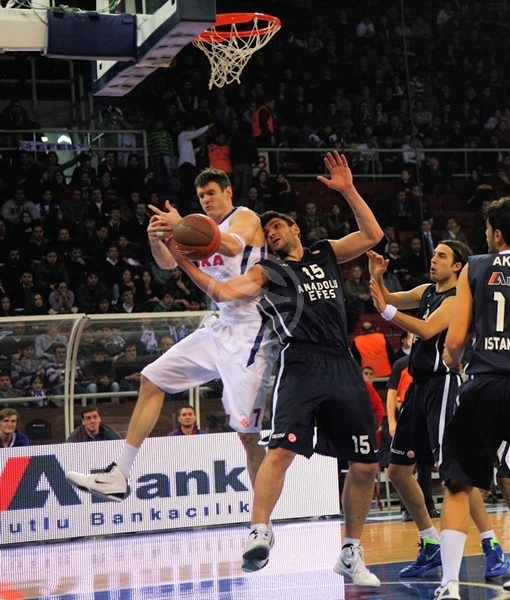 Kirilenko struck from downtown immadiately after the break, as Efes tried to speed up the game tempo. Vujacic hit a fast break layup that Teodosic bettered with a three-pointer, good for a 39-53 CSKA lead. Batista banked in a close shot but he didn't find much help around early in the third quarter. Meanwhile, Shved joined the three-point shootout to break tha game oen, 41-56. Batista scored down low and free throws by Vujacic got Efes a bit closer, 45-56. Efes was over the place in defense, diving for loose balls and getting the crowd involved. Shved fed Vorontsevich for a wild alleyoop slam that gave CSKA some fresh air at 45-56. Lafayette hit free throws but Shved found Sasha Kaun for yet another alleyoop dunk. Savanovic stepped up with back-to-back baskets but Gordon and Kaun kept CSKA way ahead, 51-64. A buzzer-beating three-pointer by Akyol got Efes within 54-64 after 30 minutes. Vujacic made free throws early in the fourth quarter, as CSKA kept struggling to score. Defense allowed CSKA to keep dominating the game, however, and free throws by Kirilenko gave his team a 55-66 edge with 8 minutes left. Efes could not find the way to the basket for more than 2 minutes and a reverse layup by Gordon sealed the outcome, 55-68. CSKA tried Anton Ponkrashov at point guard to run the game clock down and started to run its offense through Krstic, who boosted the guests' lead to 55-71. Vujacic buried a corner triple off a timeout but Gordon shocked the crowd with a slam and added a fast break layup for a 58-76 CSKA margin with over 3 minutes to go. Efes kept trying but everything was said and done already, as CSKA will keep fighting to win the competition in the upcoming Turkish Airlines Euroleague Playoffs. "We said before the game in the locker room that there are no games for nothing. We are always playing for something - for pride, for history, and for the fans. Perhaps in such situations, the coach can afford to take chances, to try some new options, but at the same time, we always play from the heart. I am glad that we won. I think, except for a few minutes, we controlled the game. There were some problems against the zone defense, but once we have fixed that, everything fell into place."